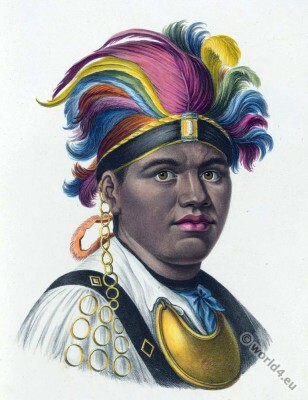 Joseph Tayadaneega (1743-1807) called the Brant, the Great Captain of the Six Nations. Thayendanegea, means “two sticks bound together”, denoting strength. Source: Natural History and pictures of the mammals by Heinrich Rudolf Schinz, Zurich, 1824. Drawn by Karl Joseph Brodtmann. Original: Naturgeschichte und Abbildungen der Säugetiere von Heinrich Rudolf Schinz, Zürich, 1824. Gezeichnet von Karl Joseph Brodtmann. This entry was posted in 1798, 18th Century, Canada, Native American, North America and tagged Native american dress, North American costumes on 3/6/16 by world4.